Who Is Allah In Islam? 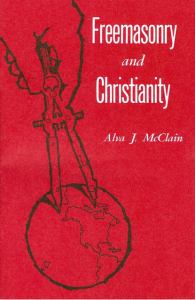 McClain, founder and first president of Grace Theological Seminary, was pastor of First Brethren Church of Philadelphia in 1929 when he wrote this small book. Because there was a growing pressure for even Christians to become Masons, McClain preached a sermon on the subject and it was printed in a booklet. These can still be ordered from BMH books, Winona Lake, IN. McClain quotes extensively from the Encyclopedia of Freemasonry, by Albert G. Mackey. He (McClain) makes the following points: 1) Masonry claims to be a religion but states that that religion is not Christianity. 2) Freemasonry rates Christianity as a ‘sectarian religion’ while boasting of its own ‘universality.’ 3) Masonry does not confess Jesus Christ as Lord and God. Therefore, the God of Masonry is not the true God. 4) The charge read at the opening of the lodge purposely leaves out the name of Jesus Christ. 5) Before entering the lodge, a Christian must disobey Jesus Christ by taking an oath. 6) Masonry teaches its members they may reach heaven, life, and immortality by a way apart from Jesus Christ.